Over time soil naturally compacted, leaving the subsoil undesireable for healthy lawn growth. Walking, playing, mowing and watering compact particles and reduce the air space necessary for root growth. Compaction is the greatest in the upper 1 to 1½ inches of soil and needs to be relieved by mechanical aeration. 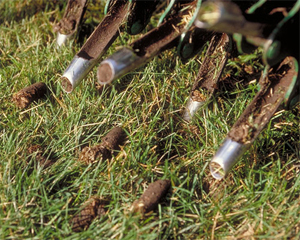 This mechanical process plugs 2-3 inch deep, finger size holes into the soil to improve the air, water and nutrient exchange with your lawns roots. Restore your lawn's health and appearance by taking advantage of this special offer. Mention this offer to receive your discount.